This update highlights new workplace safety and health resources issued by OSHA, OSHA's Susan Harwood grantees, OSHA's Alliance Program participants, NIOSH, and others. OSHA issued the following new or updated compliance assistance resources from July 1 to September 30, 2017. For a listing of all new compliance assistance products issued by OSHA, see OSHA's New Compliance Assistance Products webpage. OSHA has issued a small entity compliance guide for the respirable silica standard for general industry and maritime. OSHA previously issued a small entity compliance guide for the silica construction standard. Visit OSHA's Silica Rulemaking page for more compliance assistance resources. OSHA has launched the Injury Tracking Application, a secure website where covered employers are required to electronically submit their workplace injury and illness information. OSHA also published a notice of proposed rulemaking to extend the date by which certain employers are required to submit the information from their completed 2016 Form 300A electronically from July 1, 2017 to December 1, 2017. OSHA has updated its publications page to better engage users and improve functionality. New and popular publications are now easier to download and order. The page is formatted for all devices and platforms, from desktop monitors to smartphones. The Department of Labor has a new web page on recovery assistance for hurricanes. OSHA has a variety of resources to help employers keep their workers safe during cleanup and recovery operations after hurricanes and floods. The OSHA "Job Safety and Health - It's the Law" Poster is now available in Tagalog. The poster, available for free from OSHA, is now available in 11 languages. OSHA has issued a publication on Process Safety Management for Petroleum Refineries: Lessons Learned from the Petroleum Refinery Process Safety Management National Emphasis Program. The document highlights areas where OSHA issued the most citations during this NEP. This new OSHA fatal fact sheet reviews an incident in which a warehouse worker was fatally injured after falling seven feet from a wooden pallet elevated by a forklift. The fact sheet reviews measures to prevent these types of incidents, including not allowing workers to ride on or occupy pallets lifted by forklifts. OSHA has updated the heat stress chapter in the OSHA Technical Manual. The chapter provides an overview of heat-related illnesses, elements of a heat-related illness prevention program, and how to do a heat hazard assessment. The OSHA Technical Manual provides technical information about workplace hazards and controls for OSHA's Compliance Safety and Health Officers. The manual can also be used by other health and safety professionals, employers, and anyone involved in developing or implementing an effective workplace safety and health program. OSHA has revised it online whistleblower complaint form to help users file a complaint with the appropriate agency. The updated form guides individuals through the process of filing a complaint, providing essential questions at the beginning so they can better understand and exercise their rights under relevant laws. One significant improvement includes pop-up boxes with information about various agencies for individuals who indicate that they have engaged in protected activity that may be addressed by an agency other than OSHA. The new form is available in English and Spanish. This case study, Electric Power Industry: Lighting the Way for Safety and Health Programs, reviews how the electric power industry uses safety and health programs that focus on prevention to improve workplace safety and health. This OSHA fact sheet provides information for shipyard industry employers to evaluate their shipyard competent person programs. The fact sheet can also be used by other members of the shipyard community, such as subcontractors and inspectors, to evaluate a shipyard's competent person program. This OSHA fact sheet provides guidance on preventing and managing laboratory worker exposure to Zika virus. The following materials developed by grantees under OSHA’s Susan Harwood Training Grant Program were posted on the OSHA Web site from July 1 to September 30, 2017. See the OSHA Web site for a complete list of a materials developed by Harwood grantees. These materials do not necessarily reflect the official views of OSHA. The grantee developed training materials on aerial lift safety in the landscaping and tree care industries. The following products were issued by OSHA’s Alliance Program participants as part of the Alliance Program from July 1 to September 30, 2017. These products do not necessarily reflect the official views of OSHA. For a complete listing of Alliance products, see the Alliance Program Participants Developed Products page. Through its Alliance with OSHA, the Scaffold and Access Industry Association (SAIA) developed a video on the safe use of transport platforms. Through its Alliance with OSHA, The Joint Commission/Joint Commission Resources (TJC/JCR) developed an article called Handling with Care: Practice Safe Patient Handling. The article reviews how health care organizations can reduce the risk of musculoskeletal disorders by implementing safe patient handling and movement programs. 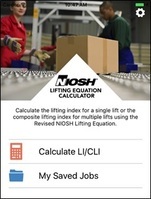 NIOSH has issued a free mobile application (app) for smart phones and other mobile devices that can help workers stay safe when manually lifting objects. The app, called NLE Calc, is based on the Revised NIOSH Lifting Equation (RNLE), an internationally recognized standard for safe lifting. NLE Calc determines a score based on the data users enter about a lifting task and provides recommendations to help users optimize the task, or perform it differently, in order to prevent injury. NIOSH also recently updated its Elements of Ergonomics Programs, a step-by-step guide to creating, implementing, and maintaining an ergonomics program. A NIOSH fact sheet reviews what parents and employers can do to keep young workers safe when they drive for work. It also summarizes the labor laws that affect young workers who drive as part of their jobs. NIOSH has also issued a report on young worker fatalities that presents surveillance data summaries on young worker fatalities from 1994 to 2013. These summaries provide an assessment of fatality patterns and trends by industry, state, region, and various demographic and injury variables. The report also includes investigative data summaries from case reports of young workers fatalities from 1982 to 2010. The document concludes with a section discussing general strategies for injury prevention among young workers, including roles for employers, parents, youth, educators, researchers, and federal and state agencies. NIOSH and the California Department of Public Health, Occupational Health Branch recently released a video to help protect oil and gas extraction workers from the hazards they face when measuring oil storage tanks. The video, "Protecting Oil and Gas Workers from Hydrocarbon Gases and Vapors," reviews the health and safety risks involved with this activity, and how employers and workers can reduce injuries and fatalities from exposure to toxic gases and oxygen-deficient atmospheres. The video features the experiences of oil and gas workers who are responsible for measuring tank levels (tank gauging) and sampling crude oil, including a truck owner/operator, a company operations superintendent, and the widow of a man who died of sudden cardiac death while gauging. The NIOSH Fatality Assessment and Control Evaluation (FACE) Program conducts investigations on workplace fatalities to identify the factors that contributed to these fatal injuries. This information is used to develop comprehensive recommendations for preventing similar deaths. The NIOSH Fatality Assessment and Control Evaluation (FACE) Program issued the following reports and products from July 1 to September 30, 2017. Foreman and Laborer Fall when Aerial Lift Struck by Vehicle - Washington. Fatality Narrative as slideshow. Carpenter Falls 60 Feet from Bridge Concrete Form - Washington. Fatality Narrative as slideshow. Framer Falls 18 Feet while Sheathing Roof - Washington. Fatality Narrative as slideshow. Truck Driver Crushed When Unsecured Equipment Falls From Trailer - Washington. Fatality Narrative as slideshow. Dairy Worker Injured When Clothes Are Caught in Straw Spreader - Washington. Fatality Narrative as slideshow. The National Safety Council teamed with Brigham and Women's Hospital to develop an online tool that employers can use to estimate how much fatigue is costing their bottom line. For example, an employer with 1,000 workers could lose about $1.4 million annually because of the effects of sleep deficiency, while the annual costs for an average Fortune 500 company could reach $80 million. The calculator also estimates how much of the burden can be avoided with programs implemented in the workplace. The U.S. Chemical Safety and Hazard Investigation Board (CSB) has issued a safety bulletin on the November 2016 fire that severely burned four workers at the ExxonMobil refinery in Baton Rouge, Louisiana. The fire occurred during maintenance activities when operators inadvertently removed bolts that secured a piece of pressure-containing equipment to a plug valve. When the operators attempted to open the plug valve, the valve came apart and released flammable hydrocarbons, which formed a vapor cloud that quickly ignited. The CSB also released an animation showing the events that led to the fire. A recent survey of small business employees conducted by an insurance company found that workplace safety was among the top criteria employees consider when evaluating a new job offer. Workplace safety ranked behind criteria such as compensation, the nature of the work, and proximity to home, but ahead of factors such as the quality of potential coworkers and opportunities for professional growth.